Frangible glass grenades of various types were used by most of the armies involved in WWII. They typically were incendiary or smoke producing types. 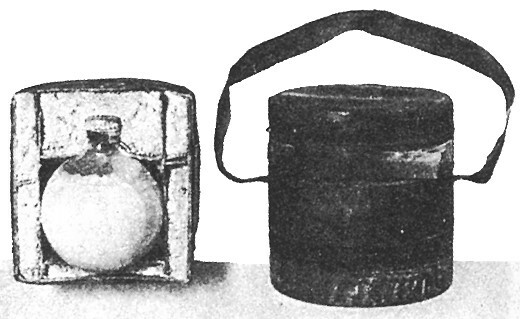 The Japanese used a variety of them, including this poison gas grenade. Frangible poison gas handgrenades were never widely used for obvious reasons. The only other that comes to mind is the French Bertrand Mle.1915 used during WWI. There are two body styles in this size, a short and long neck. This is the latter. It is spherical and about 10cm in diameter (3.9"). There are no markings evident. "Prussic Acid, Glass, Type TB"
AC (Hydrocyanic acid) is a clear liquid that vaporizes when released. It is a powerful nerve agent and in strong concentrations will kill instantly. Useful for clearing bunkers and other confined spaces. "Frangible hydrocyanic acid grenade, arsenic trichloride stabilized type. Two different types exist. One is stabilized with copper powder and is packed in a sheet metal outer container, the other is stabilized with arsenic trichloride and packed in a cardboard container. 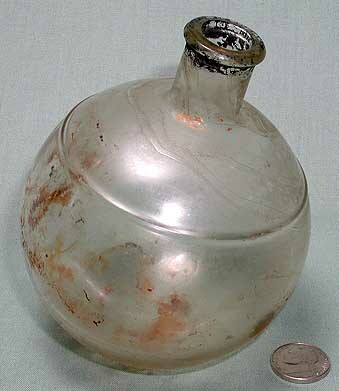 The grenade consists of a spherical glass flask about 3 1/2 inches in diameter containing approximately 1 pint of hydrocyanic acid. The flask is packed in a mixture of sawdust and a neutralizing agent. The outer container is approximately 5 1/4 inches high and 5 1/2 inches in diameter, it is painted khaki and banded in brown."